Lush cosmetics “cares about people, animals, and the planet,” said company rep Brandi Halls. 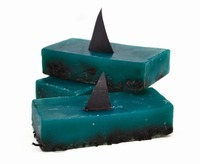 The brand has previously campaigned against the Canadian commercial seal hunt, palm oil, and dog sledding, and now Lush has set its sights on saving sharks. Due to overfishing and the growing appetite for shark fin soup, many species of sharks are rapidly facing extinction. Tens of millions are killed annually in order to serve the global fin trade, resulting in a 90 percent overall population decline in the last few decades. They are killed not only to support the culinary world, but their flesh, cartilage, and oil are also popular. The latter is often used in cosmetics. “With California’s AB 376 [banning of the possession, sale, and trade of shark fins in the State of California so close to passing, we had to take action and do all we could to ensure that this incredibly important bill gets passed,” said Halls, whose company is working with nonprofit Shark Savers to spread the word. Lush invites the public to “sign petitions to their local government officials, demanding that they outlaw the possession, sale, trade, and distribution of shark fins.” If you want to sign such a petition, visit the Lush store in Paseo Nuevo Mall before August 29.